I had to smile when I spied this absurdly happy vest at Avalon Exchange. Not only does it remind me of my evenings at the club, its borderline-costume appeal catapulted it to must-buy status. The vest ended up being free, thanks to store credit from selling Avalon some of my clothes and purses. For the vest's inaugural wear, I partied with blogger friend Niki of Saint Louis Night Out at sushi restaurant/vodka bar Sub Zero. 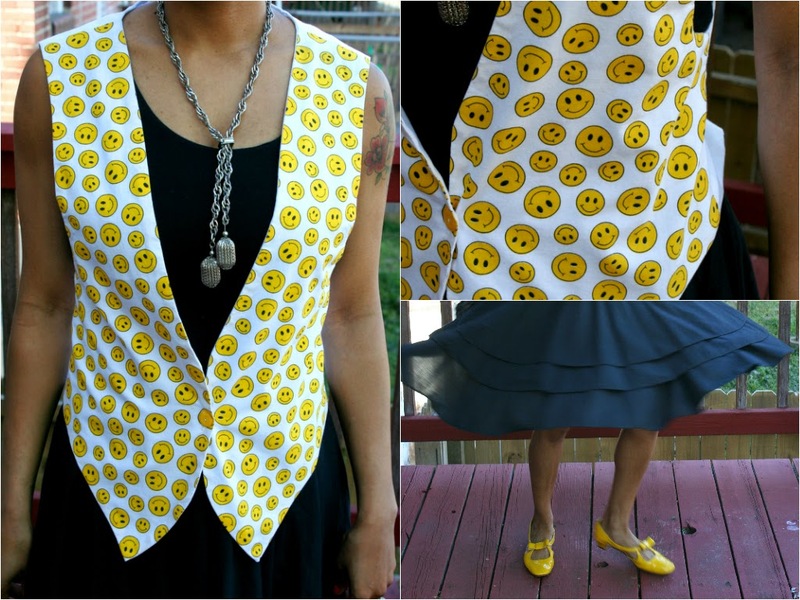 One of Niki's friends told me the vest made her smile. How can it not? The St. Louis location of Have A Nice Day Cafe closed down years ago, apparently after having too many bad days (or nights). But, no worries - smiley faces will never go out of style! Thanks, Andrea! I like the smiley face mantra-very uplifting!